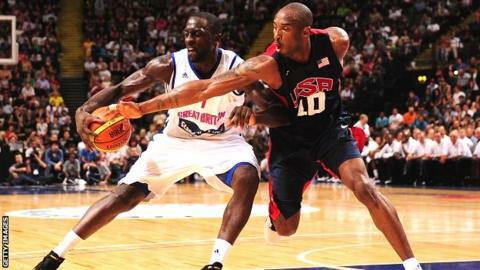 British athletes have a duty to inspire future generations when they compete at the London Olympics, according to basketball forward Pops Mensah-Bonsu. Mensah-Bonsu is from Tottenham, where nationwide riots started last summer. He says Team GB can help the country avoid a repeat of such incidents. "We owe it to the younger generation to give them an avenue to get out of that type of life," said the 28-year-old. "The future of our youth is in our hands. We have a big responsibility." Mensah-Bonsu and his team-mates, 43rd in the world, begin their campaign against 11th-ranked Russia on Sunday. They need a top-four finish in Group B - which also includes Spain (world number two), Australia (ninth), China (10th) and Brazil (13th) - to reach the quarter-finals. There are also major injury concerns over guard Mike Lenzly (torn calf muscle) and forward Dan Clark (sprained ankle) ahead of Friday's 10:00 BST deadline for submitting final rosters. It will be a tough task but Mensah-Bonsu is adamant a strong performance can have a profound effect on the British public. "We hold the future of British basketball in our hands," he explained. "It's a fairly unknown sport in this country but it has a chance to excel. "With some sort of success in these Olympics the notoriety will come, the funding will come, the fan support will come. "The younger generation will sign up for the sport if they get to see how much fun they can have. It's a responsibility we embrace with open arms. "It's very close to my heart because if somebody didn't take me under their wing and give me the leadership and mentorship I needed at the age of 13, 14 I probably wouldn't be sitting here today." Mensah-Bonsu watched on television as the 2011 riots damaged the area in which he grew up before spreading around the country. "A lot of people don't know that I was born and raised right behind Tottenham police station. Seeing that whole event play out hurt my heart," said the 6ft 9ins Besiktas player. "My parents have a church on Tottenham High Road and they were burning cars right there. They burned a couple of buildings down; I used to get my bus pass and buy sweets from stores that aren't there anymore. "Driving down that street is kind of eerie. To see it up close is difficult. That's when I felt like the Olympics were bigger than me playing basketball and representing my country. "I was a kid just like that in north London but I was able to make something of myself and get to the highest level in this sport. "If they see how far we have been able to come then they will know that it's possible and they can actually do something with their life. "That's one of the things pushing me to be successful in the Olympics."